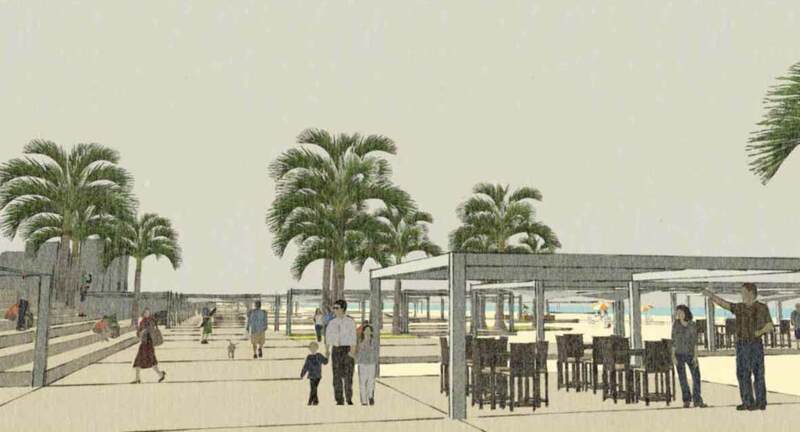 The challenge in this project was to regenerate the space of the beach, while preserving the natural site and the public that frequents it. 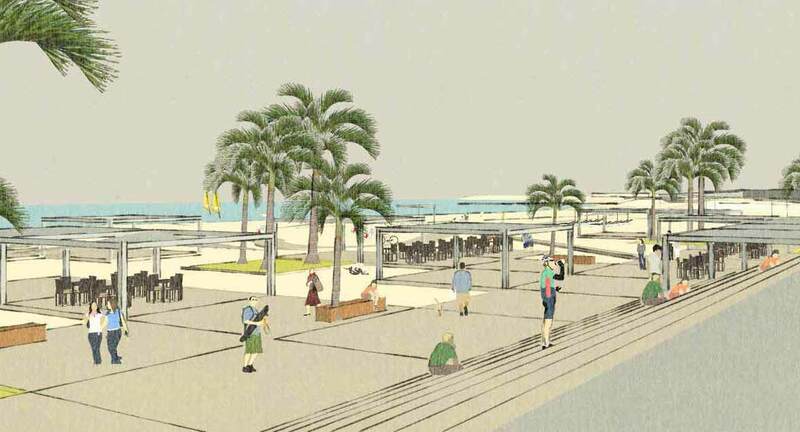 As a continuation of the Raouche Corniche the project needed to maintain the popular promenade and propose a diversified program that would attract people from different social strata. Building regulations led the team to design a minimal urban intervention through light and temporary structures and the use of ecological materials. This is low-cost adaptable architecture based on a single component, which is designed for infinite growth, different surroundings, and various demands. 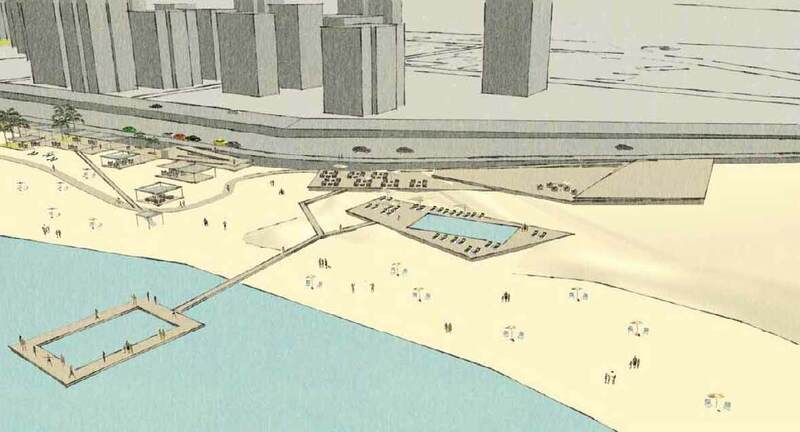 The urban strategy was aimed at preserving and maximizing the sand beach within this 1.2 km long coastal strip. 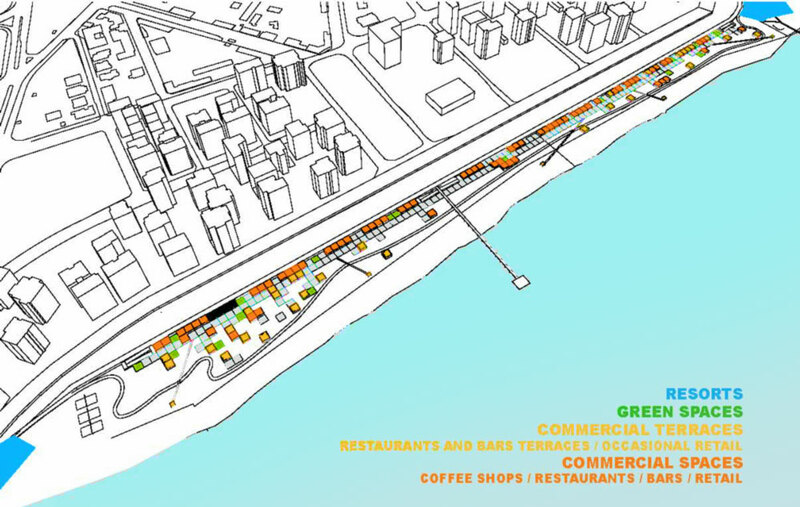 Construction height could not exceed the street level so a one-level commercial belt was designed to run along the corniche wall. The site is bordered on the sides by two resorts. 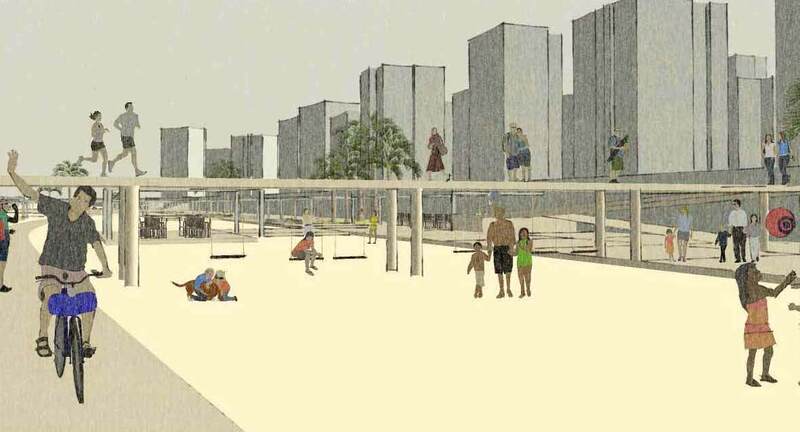 To link the project to the city, Ramlet el Baida garden, which lies across the road from the Waterfront, is extended into a pedestrian belvedere, overlooking the beach. The architectural strategy involved an expanding project that would evolve over time and with the seasons. 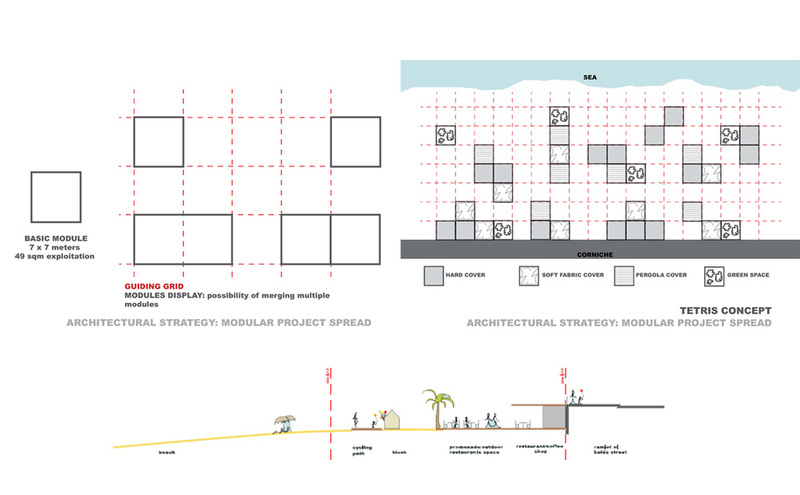 The design team created a grid, spread over the site, to guide 7x7 m modules. In Tetris-like formation, these modules are displayed on the site depending on the phase of the project. Several modules can be merged together for bigger commercial spaces. Modules vary in type; some have hard covers or soft covers (drapes, pergolas), others make up the green spaces of the project. The waterfront has three access points from the street. On the beach level a wooden deck defines the walkway, while a bike path connects both parts of the site. A wooden pier was incorporated to extend the Ramlet el Baida garden and the corniche into the sea. The main program was defined by the integration of resorts, restaurant, cafés, bars, retail outlets and kiosks into this public space. Playgrounds, sports grounds, cycling and nautical clubs could also provide a diversity of activity. Temporary amphitheaters could also be erected to create areas for outdoor cinema and concerts.